While many are familiar with "corsage" orchids given to moms on Mothers Day or by young beaus to their sweethearts on Prom Night, few know of the vast group of plants that actually compose the orchid family - the Orchidaceae. Composed of some 25,000 species, it is, perhaps, the largest family of flowering plants on earth. Orchids inhabit every continent except for Antarctica, living in just about every type of environment except for extreme deserts and salt water. In fact, you may have wild orchids growing in your lawn, on a roadside, or in a wooded area nearby. Orchid plants can range in size from entire plants that would sit neatly on a dime to large monsters that weigh several tons. Flower size itself can vary tremendously from flowers so small that a powerful microscope is needed to appreciate their beauty to flowers with petals that near three feet in length. Add to this a wealth of several hundred thousand hybrid orchids that have been horticulturally bred since the late 1800's, and you can see just how vast this group of flowering plants is. In fact, you can see a very small sampling of the diversity of orchids in the galleries and articles on our Newsletters and More page. With a family of plants so vast, it seems that at every turn, you find new and interesting parts of the orchid universe to explore. There is not "just one type of orchid" and many orchid enthusiasts end up going through several "phases" of interest as they continue to explore their hobby. They may start with "typical" plants purchased at a discount store, then branch into more specialized groups such as ladyslippers, miniature Cattleyas, Oncidium intergeneric hybrids, Encyclia species, primary Zygopetalum hybrids, pleurothallids, and the list goes on and on. Within the orchid community, there are actually specialty groups that you can join devoted to many of these specialized subsets of orchids. Many of the commonly cultivated orchids originated as epiphytes--plants that grew on the branches and trunks of host trees in much the same way as Spanish Moss and Resurrection Fern do. Florida is actually host to several native species of orchids that grow in this way. Natural vanilla flavoring comes from the cured seed pods of a species of orchid widely grown in the tropics. Not only a flavoring for ice creams, vanilla is a chief flavoring component of chocolate and a scent used in many perfumes. Vanilla plants, which are vines, can be some of the longest orchid plants, reaching lengths of well over 100 feet. Bulbophyllum moniliforme is an Australian orchid so tiny, most people overlook it, thinking that it is a moss. Florida is host to the largest number of wild-growing orchid species in the United States. 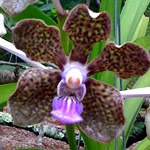 Orchids come in every conceivable color, except for true black (although some are so dark, they almost appear black). Several species of orchids growing in the Mediterranean regions mimic female bees and wasps so well, that male bees/wasps will attempt to mate with the flowers, thus achieving pollination. While orchids were once very expensive (as they had to be collected wild from the jungles), they are now mass-produced by sterile seed-sowing and tissue culture and can be as inexpensive as any other potted plant. On the other end of the scale, many highly prized orchids can sell for many thousands of dollars for a single plant. they are a member of the group of flowering plants known as "monocots" (short for Monocotyledons)...these include grasses, lilies, irises, palms, bananas, gingers, and the like. Most monocots have leaves with parallel veins and flowers with floral parts in groups of three. unlike lilies and other monocots, orchids do not have separate stamens and pistils in their flowers. Instead, the stamens and pistils are united into a single central organ known as the column. Like other monocots, orchids have flowers in groups of three parts, the outer whorl of petal-like parts, known as the sepals, are often similar to each other (but not always). The inner whorl of petal-like parts are the actual petals. 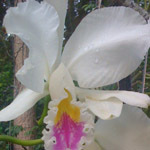 Two of the petals are similar in size and shape, but the third petal, the labellum or lip, is often different from the petals. Orchid flowers are usually bilaterally symmetrical--that is, you can only cut the flower in half and still have each part be a mirror image of the other. Many other flowers, such as many lilies, daisies, and the like are radially symmetrical--that is, they can be cut in many directions and still end up with mirror images of each half. Orchids then take these basic characteristics and end up with thousands of variations on the same theme...which is what makes them such a fascinating group of plants. 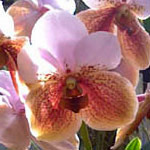 You can learn more about orchids by following some of the links on the Links page.